YMT.me: What is Cupping Treatment? It is used to treat stagnation in the channels. It can also be very helpful in expelling the external pathogenic factor of cold wind that can invade the lungs. 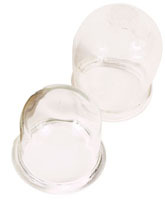 Cupping is an ancient technique that is still used by modern practitioners. This form of treatment is usually performed as an alternative to acupuncture, moxabustion, Tui Na and TDP Lamp therapy. The cups are placed over acupuncture points but they treat a larger area of the body.